Kellogg's and Homer & Jethro Ad 1964 This is a September 25, 1964 advertisement It is a nice color ad from Kellogg's of Battle Creek in a salute to the American Food Industry. It reads Good is a bargain. 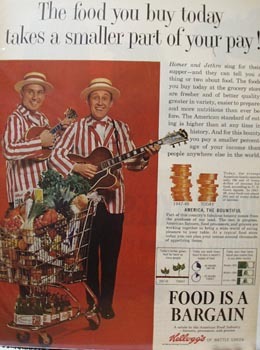 Pictures Homer and Jethro standing beside a shopping card filled with groceries and they are singing, The food you buy today takes a smaller part of your pay. Dressed in their red and striped jackets and hats. In mint condition. Photo is taken through plastic and may show wrinkles or crookedness that is not in the ad. This magazine tear sheet measures 10"" wide by 13"" tall. Items Similar To "Kellogg's and Homer & Jethro Ad 1964"